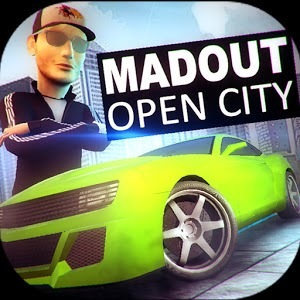 MadOut Open City is an android road drag Racing game with super 3D graphics, easy control layout, multiplayer – up to four players…Unlike other racing games where player can only push the opponent off the track or wreck his car this super game will allow you to completely get rid of your enemies car. What about smashing of cars? Yes you can do that in this game! Have the enemy overtaken you? Don’t worry you can alwaytake him out with your large arsenal, but don’t relax when doing this cause the enemy will still fight back to maintain their position. This Game has no rule the only rule is to be the first to take the flag. This game Features an Open world i mean full open so explore it, 20+ well crafted different cars available to make your gaming a wonderful one, Many racing with extra super weapons, awesome Bonuses like rockets, mines, bullet etc, Different weather conditions, super Advanced Car destruction, Angry bots and lots more. So what are you waiting for? Chose your car and rogue away!! Do you love racing game? This is a good game you gotta to try. System requirements: Android 2.3.3 and Up.